BY PATRICK VEREL on DECEMBER 4, 2018 for Fordham News. Seven business teams comprised of Fordham students and alumni will compete for cash and exposure on Saturday, Dec. 8, in the Fordham Foundry’s VentureUp! competition. The competition is the third pitch contest that the Foundry, a business incubator housed at Fordham’s Gabelli School of Business and run in collaboration with the New York City Department of Small Business Services, has held since it debuted one in April 2017. VentureUp! organizer Albert Bartosic, GABELLI ’84, entrepreneur-in-residence at the Foundry, said this year’s contest, which comes with $40,000 in prize money, is notable because all the companies competing are already operational. That’s partially due to the Foundry’s concerted effort to involve alumni this year. 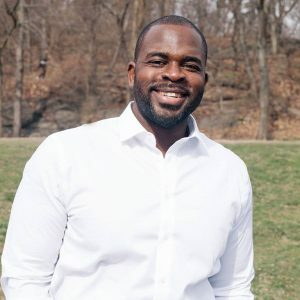 One of them is Busayo Ogunsanya, GABELLI ’08, ’12, who founded Ask My Uncle Sam, a website which answers basic tax question and helps accounting professionals free up time to serve more clients. It’s Ogunsanya’s third company since he graduated with degrees in accounting. The site is an outgrowth of his first business, Big Apple Tax Return, which he started after a stint at Ernst & Young. “What I realized during this period was a lot of clients have tax questions. For me, it was very time consuming to answer very basic questions,” he said. The idea was to create a database of thousands of answers to common questions and then harness artificial intelligence to create a chatbot that can be accessed on a phone or tablet. Initially, it will only be marketed as a business-to-business product, for use by practitioners such as H&R Block, not for the general public. “I want to come back as a double Fordham alumnus to show that its possible for an alum to take chances and also be successful,” he said. If Ogunsanya’s goal is to help people save money, Joseph Zoyhofski, a native of Buffalo and a second-year undergraduate student at Gabelli, wants to help people use that cash to bond with each other. 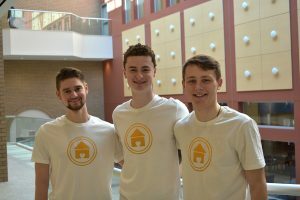 What’s Cooking, a meal-sharing platform that connects users through home-cooked meals, is a joint entry from Zoyhofski and classmates Liam Scott and Alex TenBarge. Users advertise on the site a meal they’d like to make at home, as well as how much they plan to charge for it. Those interested can sign on, and the site charges a small processing fee on top of the price of the meal. The group’s plan won the People’s Choice Award at the Foundry’s second pitch contest, and Zoyhofski said he feels the company’s success so far shows potential for expansion. “There’s nothing I miss more about Buffalo than home-cooked meals,” he said. What’s Cooking has coordinated 40 meals with eight to ten Fordham students since it went live. The goal is to expand it beyond Fordham to the general public. Zoyhofski, who has been working with both Fordham’s Social Innovation Collaboratory and the Law School’s Entrepreneurial Law clinic, said there’s a need for a platform to meet new people over a home-cooked meal. “Some of the students who’ve used What’s Cooking have made really close connections with people they’ve never met before from going to these meals,” he said. The competition will be judged by Dave Yonamine, founder of MobilityWare, John Abplanalp, former CEO and president of Precision Valve Corporation, Jim Dugan, CEO and co-founder and managing partner of OCA Ventures, Josh Futterman, founder of ParkYou! and Alicia Syrett, founder and CEO of Pantegrion Capital. Teams will be judged on the company’s ability to scale up, the look of its team, and the look of its business model. Bartosic said judges will also be on the lookout for any intangible, “wow factor” that might make a company really stand out. The other contestants include bizdevIQ, an on-demand marketplace for tech and business experts to meet in-person with business owners and emerging entrepreneurs, R3 Printing, an industrial 3D printing firm, Brevitē, a manufacturer of gear for the modern explorer, Bound, an app that holds people accountable to meetings and events, and Make Muse, a newspaper-meets-literary-magazine for women. He said one measure of event’s success will be new connections between fellow entrepreneurs, as well as the future entrepreneurs it inspires. “If you want to make a pitch, but you’re nervous and you don’t know how to do it, you can sit in the audience and watch seven people do it,” he said. Additional support for the competition has been provided by the NASDAQ Educational Foundation.